The artist wishing to tackle dog portraiture for the first time may encounter problems with making the dog look convincing. The fur looks too neat or uniform, the eyes almost human, the muzzle area a little cartoonish, culminating in an amateurish dog portrait. 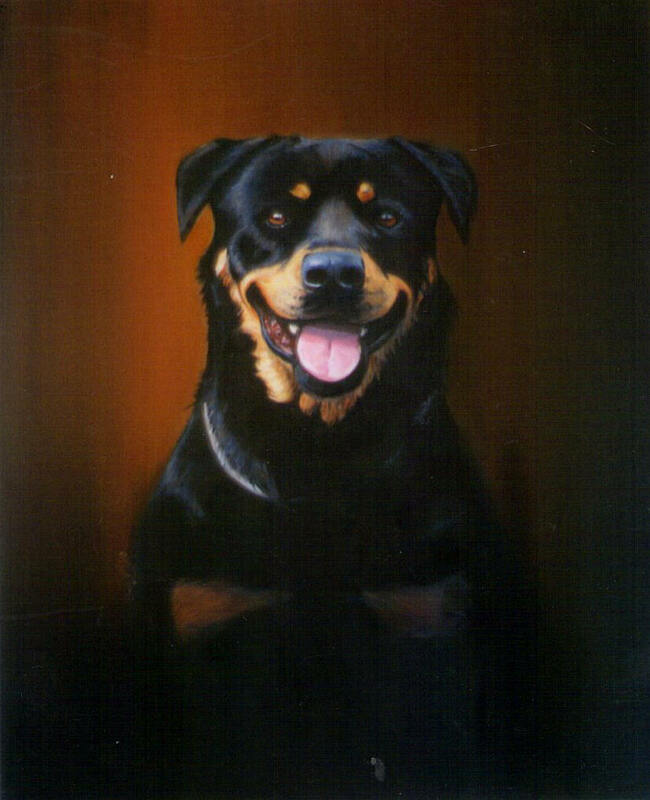 What art techniques can the artist use to achieve effective dog oil paintings? Guess-working areas of the dog’s head due to poor photographic reference. Subconsciously making connections between a dog’s features and human features causing human characteristics to leak into the dog portrait. Portraying dog features in an idealised or generalised fashion, as opposed to what the eye actually sees. For example, all dogs’ upper mouths are posterior-shaped, all dogs’ noses look like black buttons and the muzzle area protrudes from the upper face, etc. Using only white to illustrate the dog’s teeth and eyeballs around the irises. Using lines to represent the edges to the dog’s features, such as the nose or ears, where no lines may actually be seen. Using any brown, black beige or white to illustrate the dog’s fur. Using any brown, blue or green to illustrate the dog’s irises and then punctuating each with a black dot for pupils and finishing off with a white highlight. Forgetting to periodically look at the dog photograph when copying the dog portrait. Good photographic reference is essential to any dog portrait, for no dog will sit still for long (unless when asleep). If possible, take several photos of the dog, in order to select the best one. Natural daylight is always best. Side-lit will bring out contours of the dog’s face. Good lighting will also enable the photographer to use a high shutter speed with high resolution, which is essential for animal photography. Avoid flash photography, as this will make the subject matter appear flat. With good photographs, improvements to dog portraits are possible, but the following advice for pet artists will also create a more professional painting of a dog’s head. Transpose the drawing of the dog as accurately as possible, for this will form the foundation of the painting. Use a lightbox or projector if necessary. To prevent preconceptions about how a dog’s face should look like, turn the photograph and the dog painting upside down. This will cause the image to dissolve into unfamiliar shapes, forcing the brain to make sensitive observations about the dog. Look out for subtle colour shifts and tones within the dog fur. Violets, crimsons, ochres and creams can be found in dog hair. Highlights often contain a little blue or mauve, blacks sometimes contain crimsons. Dog’s teeth and eyeballs often contain darks which give them form. Look out for blues, violets and browns as wells as white. Dog’s gums and tongues can be black, brown, mauve or maroon as well as red or pink. Not every division between features require outlines. The contours of a dog’s snout may not always be visible; other delineations may be pale in colour as well as dark. Great techniques for a dog portrait can be found in glazing and dry brushing. Applying two or three layers of thinned oil paint can be used to improve upon the last layer and to create rich colours, often seen in dog’s fur. The following are also worth consideration. It is easy to edit the background to a dog painting. Using a contrasting colour will make the dog appear more striking. A warm ochre for a dog exhibiting cool colours, such as blue-black or snow-white. Or how about a dark blue background for a toffee-coloured dog? Avoid garish colours that could rob the focal point from the dog. Smooth backgrounds can be achieved by gently stroking a clean soft cloth over the paint layer to rid of unwanted brushmarks. Repeat with the next layer once dry to achieve a high finish. Look out for different-coloured highlights on the dog’s fur such as in the eyeballs, the rims, around the snout, the ears and the lips, which might be eggshell blue, pastel pink or cream. Similarly look out for various darks: blue-blacks, crimson-blacks and violet-blacks, which could be found beneath the chin, ears or in the mouth. Highlights from moisture around the tongue, snout and lips can be suggested by dragging neat white onto selected areas from a fine sable. Sable brushes are vital for detail such as around the eyes and the hair. Large areas and glazes can be applied with fan brushes or wide hog brushes. Linseed oil can be added to the oil paint to add transparency and flow, ideal for glazing techniques. The artist who wishes to apply glazes quickly can use alkyd oil paints instead, for it dries quickly. I find the following oil colours ideal for dog portraits: titanium white, burnt sienna, burnt umber, French ultramarine, pthalo blue, permanent rose and cadmium red. Reserve black only for the pupils. And of course, look out for other colours in the dog, some of which could be bizarre.